It’s only Tuesday and it’s been quite the interesting week for fans of Gotham. Unless your phone or computer have been offline for the past 24 hours, odds are that you’ve seen official, high quality pictures of the Batman prequel series’ Joker by now. Of course, this isn’t the first iteration that’s been played by Cameron Monaghan, but this heavily scarred fellow is that of Jeremiah Valeska’s final evolution. In other words, we’ve met this universe’s take on the Clown Prince of Crime at long last. As was to be expected, the online community doesn’t know what to make of this. Even though I remain internally conflicted, I remind myself that it’s all about the performance – and Monaghan is most assuredly still bringing his A-game. 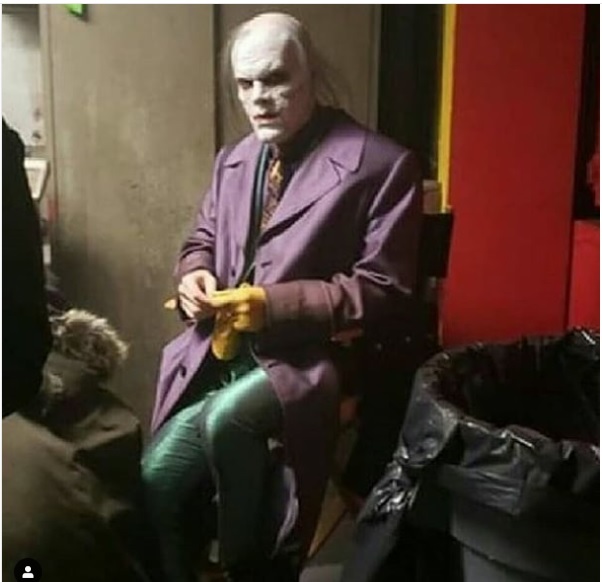 And if you’re still up for checking out more images as the finale draws near, then be sure to feast your eyes on this behind-the-scenes shot that comes to us by way of “GothamCityLover” on Instagram. As you can tell, Monaghan is enjoying a moment of rest in between takes, though it looks like he wasn’t quite ready to have his picture taken. Still, it’s a decent look at the new suit, proving that even with that questionable haircut, the Ace of Knaves has impeccable taste in clothing. Be sure to catch the series finale of Gotham when it arrives on Thursday, April 25th on Fox.